I'm happy to be able to share some exciting news with you! 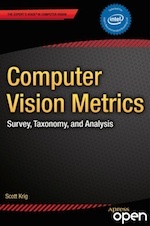 The Embedded Vision Alliance has joined with Apress Media and author Scott Krig to enable free publication of Scott's new book "Computer Vision Metrics: Survey, Taxonomy, and Analysis" on the Alliance website. At the moment; the book's introduction, bibliography and first two chapters are available for you to both read online and download as PDFs; successive chapters and other book sections will follow in future weeks. If you're based in the United States and are willing to post a review of the book to the website's discussion forums, we have a limited number of complimentary print copies available as thank-you gifts. Email us with your commitment and contact information, for consideration. And if you're interested in purchasing a print copy, visit Apress's website for more information.